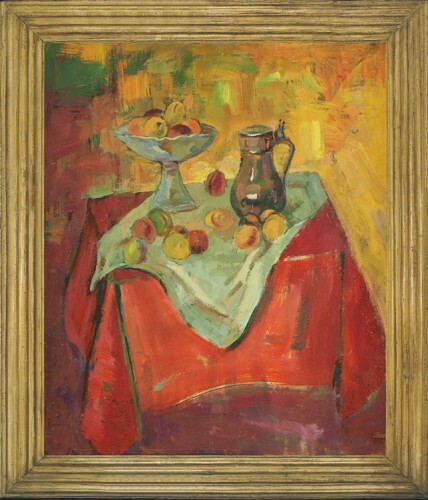 This burning, autumnal still life, saturated in golds, oranges and reds, explains why Ramah’s art can be described as fauviste. It is glowing and vibrant with life, completely removed from his delicate watercolours of flowers and the book illustrations which exploit chiaroscuro to dramatic effect. It has something in common with still life works by Rik Wouters, almost his contemporary; but it is darker, richer, more incendiary and mysterious than anything Wouters painted. The forms of fruit-bowl, coffee pot and table are perfectly realized and sited in three-dimensional space; the composition is tranquil; but the background has dissolved into a landscape of sunshine and fire in which the gods of spring and autumn appear to contend. Painted on the other side of the board is a landscape featuring a village which rises amongst trees from a hollow between rolling hills. It is completely different from the still life with which it is paired, painted in sombre olives, ochres, and blue-greys; however, the hills have their own internal significance, and appear to be instinct with a shifting, flowing life. ‘Ramah’ was the nom-de-plume of Henri François Ramaeker, born in Sint-Joost-ten-Node in September 1887. He seems to have had little official training, although he did attend a fine art course. He worked in many genres and media: oil paint, watercolour, pastel and pencil; he produced etchings, engravings, illustrations and cartoons. He is included amongst the fauviste artists of Brabant. Having made quite a lot of money as a portraitist of celebrities, he abandoned this calling to follow his own leanings, experimenting with Cubism and Orphism. In 1913 he produced 15 etchings to illustrate Les villages illusoires, a poetry collection by Emile Verhaeren, originally published in 1895 but then reissued as a collector’s edition – the binding by Henry van de Velde and the text designed by Georges Lemmen. Works in public collections include those in the museums of Anvers and Brussels.